Read our reviews and you will decide to spend your vacation at our Garden Villa in San Miguel. "Heaven on Earth", "soooo affordable", "Exceeded our expectations" "paradise in San Miguel" "ideally situated" "quiet oasis in the center of San Miguel's hustle bustle", "thumbs up!" Come and experience what the rave reviews are all about. This light filled, two bedroom villa, with it's large walled garden, in San Miguel's historic center is the perfect place to begin your San Miguel vacation. Newly renovated with skylights and glass paneled French doors, the villa is spacious, bright and sunny to enhance your holiday enjoyment. In the garden, a bubbling fountain will soothe away your cares as you read and relax in the shade of our 100 year old mesquite tree. Pomegranate, avocado, orange and lime trees compliment the property and the butterflies and hummingbirds visit daily. The living room, incorporates an original stone wall, and is beautifully decorated in bright Mexican colors. There is a 40" flat screen t.v and a gas fireplace adds a romantic touch and takes the chill off cool winter evenings. Dining can be enjoyed indoors or alfresco on the villa veranda beside the fountain. Kitchen is fully equipped with full sized fridge and stove, microwave oven and other small appliances. The large master-suite has a king size bed, which can be converted into two twins if you prefer, a gas log fireplace, t.v., walk in closet and en suite bathroom The second bedroom has a queen size bed, fireplace and en suite bathroom. Both bathrooms are decorated with colorful Mexican hand painted sinks and tiles. In the traditional Mexican style, all rooms have glass paneled doors that open to a peaceful garden area. The villa sits in a large walled garden and is part of a complex which includes the owner's main house, and a one bedroom casita. See our short video on this site for an overview of the property. All three units are situated to insure privacy for the occupants. For overflow villa or casita guests visiting for short term, we also offer a queen sized bedroom with en-suite bath and fireplace which can be reserved at reasonable nightly rates.. The one bedroom casita on the same property is also available for rent at vrbo #181896. Total guest sleeping accommodations could number 9 using the villa, the casita, and the guest suite in the main house, making this a perfect location for family reunions or a group gathering. Maid service is provided daily and is included in the rental price. There is reliable and fast speed Wireless internet throughout the property.. Located in the historic center of town, we are a short 3 block level walk to the main square,(El Jardin). Historical landmarks, fine restaurants, laundry services, cinemas, pharmacies, food and artisans markets, live theater, art galleries and supermarkets are all within easy walking distance. Contact owner through vrbo web site for special two-week and three-week rates. After traveling the world and living in many countries - Canada, England, France, Italy, India and Brazil, - I discovered the Unesco World Heritage town of San Miguel de Allende, Mexico in 2006 . It was an easy decision to unpack my suitcases and settle down. The Spanish colonial architecture delights my eyes as I walk the cobblestone streets. The sun shines daily and the climate suits me to a T. There is an incredible expat community in this town, many are travelers like myself, artists and writers. San Miguel offers a banquet of cultural activities, live theater, music festivals and art openings. And we have one of the largest English libraries in Latin America. As an avid reader this is a big bonus for me. It took two years to convert my old adobe house with large garden into a guest house with, my own home, a two bedroom villa (181940), a one bedroom casita (181896)and a studio apartment. Renovating and decorating is my passion. The main house, which is my home, is an old adobe hacienda style house. The villa is newly constructed using part of an old construction in the garden and the casita has been converted from a wing of the original house. The property's great location and the challenge of rescuing an old neglected place and making it beautiful motivated me to buy. Located in the historic center of town where I wanted to make my own home, and it had potential to renovate part of the old historic construction into comfortable rental accommodations Location, Location, Location. Everything within a few minutes walk away. Yet the large garden in the historical center provides a quiet respite from the busy town. Right in the historical heart of San Miguel, you can be in the Jardin, the main square, in a few minutes. There is no need to have a car since everything is close by. Walk the cobblestone streets, lined with flowers on the way to your favorite restaurant. Magic happens here on a daily basis, and at Casa Mandu you are right in the center of it all, but our garden oasis is the perfect place to relax with a book or just sit and watch the butterflies and hummingbirds flit from flower to flower. Casa Mandu is a Tropical Oasis! Ruth is a veteran hostess and made our first stay in San Miguel a great memory. Our 10 day stay at Casa Mandu was wonderful. The villa and gardens are beautiful and our host, Ruth, was so thoughtful and readily available with suggestions on what to do during our stay as well as answering any questions we had. The villa is immaculate and the gardens tended daily. The hills and steep roads in SMA can make walking difficult. Casa Mandu is very close to the Jardin and on level ground. After a busy day and evening of sightseeing, it is so relaxing to come back to the beautiful surroundings of the villa. We will definitely return to SMA and make our reservation to stay at Casa Mandu.. Thank you so much for your lovely review. We enjoyed having you and Jean staying with us. Hope you will come back again. Casa Mandú is a piece of paradise, my mother and I had a lovely relaxing vacation. 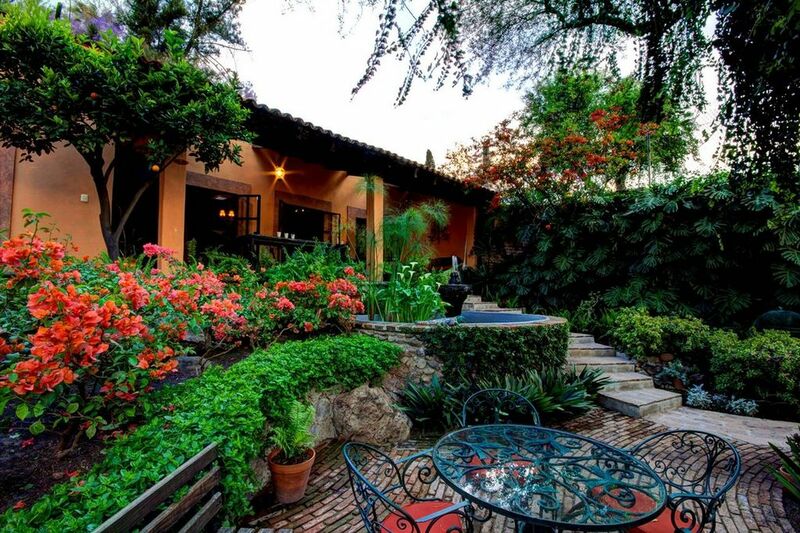 Ruth is a great source of information while you explore San Miguel de Allende. Lucinda, Thanks for taking the time to write a review of our property. it was lovely hosting you and your mother for her birthday. we hope you will come back another time. Kat Mandu is one of the most beautiful spaces in SMA. The gorgeous flora and fauna in the courtyard envelop you as soon as you walk through the door. All the rooms surround gorgeous trees and fountains. It is truly like paradise. We stayed in the villa, and it was perfect for our girls’ trip. The rooms were spacious, comfortable and clean, and each one had privacy while being connected to the other. Ruth, the owner, is so sweet and accommodating. She helped us with everything from getting taxis, telling us how to get places, suggesting sights, tipping, securing massage and dinner reservations, etc., etc. You will love her and you will love staying at Kat Mandu! These two guests arrived hesitantly in Mexico challenging fears brought about by negative reports they had received from family and friends back home in the US. They soon relaxed and enthusiastically explored all that San Miguel has to offer. We were happy to see they were soon sleeping with their bedroom doors open to the garden and we look forward to their return visit. Our family of three loved our stay at Casa Mandu. The villa and surrounding gardens are even more beautiful than the photos. We found it to be very private despite being part of a "compound." The location gives excellent access to Centro- bakeries, restaurants, churches, the Jardin--all within steps. We could pop in and out during the day, exploring for the morning, then coming home to our refuge for a nap or a cool drink in the garden before heading out again. Ruth is a fantastic host with great suggestions for sights and meals. We highly recommend staying here! We enjoyed having you and your family here at Casa Manda. So glad you were pleased with everything. Thanks for the lovely review. You make a good point that your privacy was not compromised despite being part of a three-unit compound. Clean, well appointed, luxurious, fabulously decorated. Ruth was kind, boundaried and very helpful. Fantastic place! Thanks so much Ruth! It is always a pleasure to have guests who really appreciate all that we, and San Miguel, have to offer. We are so glad that Casa Mandu and San Miguel lived up to your high expectations. Extra person charges for more than two occupants at the rate of $15 US per person per night.